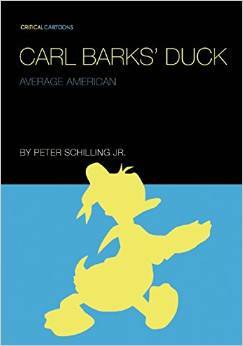 Carl Barks’ Duck: Average American, by Peter Schilling Jr. – book review by Fred Patten. Carl Barks’ Duck: Average American, by Peter Schilling Jr. Illustrated. Minneapolis, MN, Uncivilized Books, January 2015, trade paperback $12.95 (122 pages). Furry literature is all well and good, but it’s important to remember that furry fandom did not invent it. One of the most important influences that led to furry fandom, and furry literature today, was the Donald Duck and Scrooge McDuck stories written and drawn by Carl Barks (1901-2000) during the 1940s and 1950s. Today, those comic-book stories are all being reprinted, and are the subject of serious literary analyses. Here is something that is a little lighter. From this example, Critical Cartoons is a series of small, thin books of literary criticism about comic books, each by an expert of sorts. Peter Schilling Jr. is the author of Mark Twain’s Mississippi River: An Illustrated Chronicle of the Big River in Samuel Clemens’s Life and Works, a combination 19th-century travelogue and third-person nostalgia piece, and The End of Baseball: A Novel. Schilling identifies himself in the Introduction as a lifelong hater of “comic books”, but as a youth he made an exception for the Donald Duck comics by “the Good Artist”. Eventually, as he grew up and comic-book scholarship began to be published, he learned who Carl Barks was. 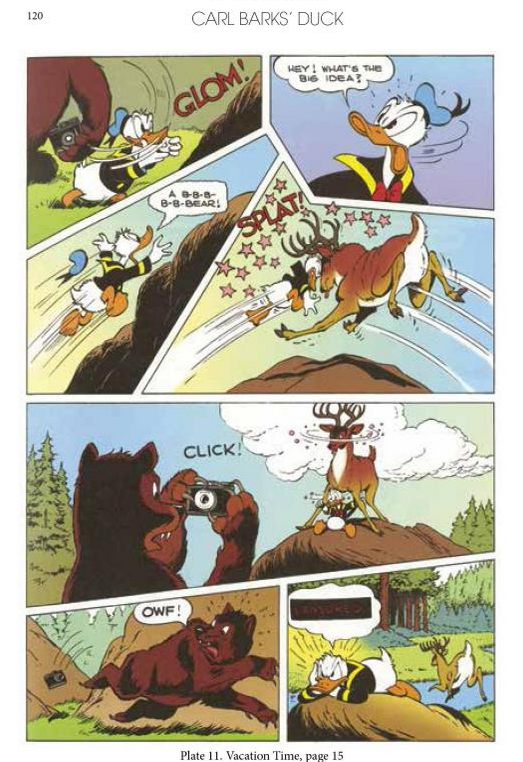 In Carl Barks’ Duck: Average American, Schilling has had the excuse and the opportunity to go back to his beloved childhood comics and re-enjoy them as he dissects and analyzes them. There are samples of Carl Barks’ best work, including eight pages in full color, but for the most part each chapter of ten to twenty pages consists of Schilling’s lengthy plot synopses and analyses of his favorite Donald Duck stories from the 1940s and ‘50s. “Maharajah Donald”. “Lost in the Andes”. “Luck of the North”. “The Gilded Man”. “The Magic Hourglass”. “Vacation Time”, which Schilling calls ‘The Forgotten Masterpiece’. “The Golden Helmet”. Finally, a potpourri of Barks’ best short stories and one-pagers: “Land of the Totem Poles”, “No Such Varmint”, and what Schilling calls ‘The Work Stories’, each of which begins with Donald as Duckburg’s master of a particular trade – rainmaking, glass repairing, building deconstruction, barbering — and goes on to depict what goes hilariously wrong. Schilling explains in detail why he likes Barks’ Donald Duck but never was fond of his Scrooge McDuck. As he saw and still sees it, Donald is the “average American”, always striving for success, trying to prove that he’s at least as good as everybody else. Scrooge, in contrast, is always the master capitalist/plutocrat, an elderly duck so greedy for another dollar (which he clearly doesn’t need) that the reader must wonder why he doesn’t just retire and spend his time enjoying what he has spent his life accumulating. Barks himself realized that this made Scrooge too unappealing, so most of the Scrooge stories are about him, with the assistance of Donald and the nephews, trying to foil thieves like the Beagle Boys, Magika De Spell, or Flintheart Glomgold who are out to steal Scrooge’s money. Much of Schilling’s writing is his describing and analyzing the obvious (if you are lucky or rich enough to have all these stories in today’s expensive reprint libraries), but there is some interesting behind-the-scenes information here. In other words, for all this book’s footnotes and four-page bibliography, Carl Barks’ Duck: Average American reads more like an intelligent layman’s observations than an academic expert’s revelation of an unveiled truth. If Schilling is not an expert, why are his opinions better than anyone else’s? Schilling clearly has loved Barks’ Donald Duck stories since they were first published in the 1940s and ‘50s. Writing Carl Barks’ Duck: Average American must have been a pleasure, to get paid for reminiscing and considering in detail those favorite stories over again. The reader shares that pleasure at the same time as being educated about Carl Barks, Donald Duck, and the world of the Duck Family. If you want to know about them without having to read a more scholarly analysis (such as Imperialist Ideology in the Disney Comic by Armand Mattelart, which analyzes Barks’ Duck stories from a Marxist viewpoint), Carl Barks’ Duck: Average American (cover design by Uncivilized Books’ Tom Kaczynski) is what you want.